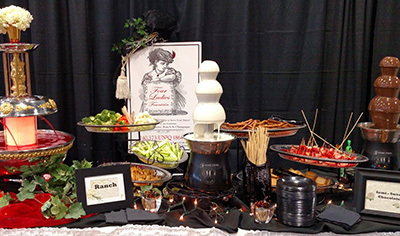 Looking for a UNIQUE way to serve your guests…try one of our fountains…Chocolate, Caramel, Ranch, Nacho Cheese or Champagne. Choose our fountains for Wedding, Birthday, Anniversary, Graduation, Bridal Shower, Baby Shower or Corporate Event – Any occasion that calls for a UNIQUE bit of flair! Prices are $3.75 per person, which includes your choice of 2 fountains – this price is per each adult or child over 4 years of age. * Minimum of 100 guests per order. There is a 20% deposit to hold a date, with the balance due 1 month prior to the event. *Prices are subject to change without notice unless under contract with A Unique Flower and Gift Shop. **Some dippables may require an additional charge per person. Add a Hot Chocolate Bar to your fountain rentals at $1.50 per person – in addition to the rental of 2 fountains at the cost given above. This price includes hot chocolate, 2 dippables, 2 syrups, whipped cream, cups, spoons, and all display pieces. Price includes a stand-by staff member to perform the same duties listed above with fountain rental.